In astrophysics, gravitational redshift or Einstein shift is the process by which electromagnetic radiation originating from a source that is in a gravitational field is reduced in frequency, or redshifted, when observed in a region at a higher gravitational potential. This is a direct result of gravitational time dilation - if one is outside of an isolated gravitational source, the rate at which time passes increases as one moves away from that source. As frequency is inverse of time (specifically, time required for completing one wave oscillation), frequency of the electromagnetic radiation is reduced in an area of higher gravitational potential. There is a corresponding reduction in energy when electromagnetic radiation is red-shifted, as given by Planck's relation, due to the electromagnetic radiation propagating in opposition to the gravitational gradient. There also exists a corresponding blueshift when electromagnetic radiation propagates from an area of higher gravitational potential to an area of lower gravitational potential. If applied to optical wavelengths, this manifests itself as a change in the colour of visible light as the wavelength of the light is shifted toward the red part of the light spectrum. Since frequency and wavelength are inversely proportional, this is equivalent to saying that the frequency of the light is reduced towards the red part of the light spectrum, giving this phenomenon the name redshift. where is the wavelength of the electromagnetic radiation (photon) as measured by the observer. is the wavelength of the electromagnetic radiation (photon) when measured at the source of emission. where denotes Newton's gravitational constant, the mass of the gravitating body, the speed of light, and the distance between the center of mass of the gravitating body and the point at which the photon is emitted. The redshift is not defined for photons emitted inside the Schwarzschild radius, the distance from the body where the escape velocity is greater than the speed of light. Therefore, this formula only applies when is larger as . When the photon is emitted at a distance equal to the Schwarzschild radius, the redshift will be infinitely large, and it will not escape to any finite distance from the Schwarzschild sphere. When the photon is emitted at an infinitely large distance, there is no redshift. The gravitational weakening of light from high-gravity stars was predicted by John Michell in 1783 and Pierre-Simon Laplace in 1796, using Isaac Newton's concept of light corpuscles (see: emission theory) and who predicted that some stars would have a gravity so strong that light would not be able to escape. The effect of gravity on light was then explored by Johann Georg von Soldner (1801), who calculated the amount of deflection of a light ray by the sun, arriving at the Newtonian answer which is half the value predicted by general relativity. All of this early work assumed that light could slow down and fall, which was inconsistent with the modern understanding of light waves. Once it became accepted that light was an electromagnetic wave, it was clear that the frequency of light should not change from place to place, since waves from a source with a fixed frequency keep the same frequency everywhere. One way around this conclusion would be if time itself were altered—if clocks at different points had different rates. and for an observer at a constant value of r, the rate at which a clock ticks, R(r), is the square root of the time coefficient, R(r)=r. The acceleration at position r is equal to the curvature of the hyperbola at fixed r, and like the curvature of the nested circles in polar coordinates, it is equal to 1/r. The rate is faster at larger values of R, away from the apparent direction of acceleration. The rate is zero at r=0, which is the location of the acceleration horizon. where the speed of light has been restored to make the gravitational potential dimensionless. where again the c's have been restored. This expression is correct in the full theory of general relativity, to lowest order in the gravitational field, and ignoring the variation of the space-space and space-time components of the metric tensor, which only affect fast moving objects. Using this approximation, Einstein reproduced the incorrect Newtonian value for the deflection of light in 1909. But since a light beam is a fast moving object, the space-space components contribute too. After constructing the full theory of general relativity in 1916, Einstein solved for the space-space components in a post-Newtonian approximation, and calculated the correct amount of light deflection – double the Newtonian value. Einstein's prediction was confirmed by many experiments, starting with Arthur Eddington's 1919 solar eclipse expedition. The changing rates of clocks allowed Einstein to conclude that light waves change frequency as they move, and the frequency/energy relationship for photons allowed him to see that this was best interpreted as the effect of the gravitational field on the mass–energy of the photon. To calculate the changes in frequency in a nearly static gravitational field, only the time component of the metric tensor is important, and the lowest order approximation is accurate enough for ordinary stars and planets, which are much bigger than their Schwarzschild radius. The receiving end of the light transmission must be located at a higher gravitational potential in order for gravitational redshift to be observed. In other words, the observer must be standing "uphill" from the source. If the observer is at a lower gravitational potential than the source, a gravitational blueshift can be observed instead. Tests done by many universities continue to support the existence of gravitational redshift. Gravitational redshift does not assume the Schwarzschild metric solution to Einstein's field equation – in which the variable cannot represent the mass of any rotating or charged body. A number of experimenters initially claimed to have identified the effect using astronomical measurements, and the effect was eventually considered to have been finally identified in the spectral lines of the star Sirius B by W.S. Adams in 1925. However, measurements of the effect before the 1960s have been critiqued by (e.g., by C.M. Will), and the effect is now considered to have been definitively verified by the experiments of Pound, Rebka and Snider between 1959 and 1965. 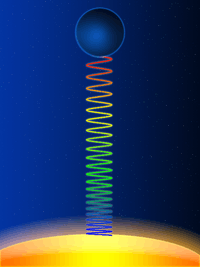 The Pound–Rebka experiment of 1959 measured the gravitational redshift in spectral lines using a terrestrial 57Fe gamma source over a vertical height of 22.5 metres. A commonly cited experimental verification is the more accurate Pound–Snider experiment of 1965. James W. Brault, a graduate student of Robert Dicke at Princeton University, measured the gravitational redshift of the sun using optical methods in 1962. More information can be seen at Tests of general relativity. In 2011 the group of Radek Wojtak of the Niels Bohr Institute at the University of Copenhagen collected data from 8000 galaxy clusters and found that the light coming from the cluster centers tended to be red-shifted compared to the cluster edges, confirming the energy loss due to gravity. Gravitational redshift is studied in many areas of astrophysical research. When using special relativity's relativistic Doppler relationships to calculate the change in energy and frequency (assuming no complicating route-dependent effects such as those caused by the frame-dragging of rotating black holes), then the gravitational redshift and blueshift frequency ratios are the inverse of each other, suggesting that the "seen" frequency-change corresponds to the actual difference in underlying clockrate. Route-dependence due to frame-dragging may come into play, which would invalidate this idea and complicate the process of determining globally agreed differences in underlying clock rate. While gravitational redshift refers to what is seen, gravitational time dilation refers to what is deduced to be "really" happening once observational effects are taken into account. ↑ See for example equation 29.3 of Gravitation by Misner, Thorne and Wheeler. ↑ Pound, R.; Rebka, G. (1960). "Apparent Weight of Photons". Physical Review Letters. 4 (7): 337–341. Bibcode:1960PhRvL...4..337P. doi:10.1103/PhysRevLett.4.337. . This paper was the first measurement. ↑ Bhattacharjee, Yudhijit (2011). "Galaxy Clusters Validate Einstein's Theory". News.sciencemag.org. Retrieved 2013-07-23. Michell, John (1784). "On the means of discovering the distance, magnitude etc. of the fixed stars". Philosophical Transactions of the Royal Society. 74: 35–57. doi:10.1098/rstl.1784.0008. Laplace, Pierre-Simon (1796). The system of the world (English translation 1809). 2. London: Richard Phillips. pp. 366–368. Soldner, Johann Georg von (1804). "On the deflection of a light ray from its rectilinear motion, by the attraction of a celestial body at which it nearly passes by". Berliner Astronomisches Jahrbuch: 161–172. Albert Einstein, "Relativity: the Special and General Theory." (@Project Gutenberg). Pound, R.V. ; Rebka, G.A. ; Jr (1959). "Gravitational Red-Shift in Nuclear Resonance". Phys. Rev. Lett. 3: 439–441. Bibcode:1959PhRvL...3..439P. doi:10.1103/physrevlett.3.439. Pound, R.V. ; Snider, J.L. (1965). "Effect of gravity on gamma radiation". Phys. Rev. B. 140: 788–803. Bibcode:1965PhRv..140..788P. doi:10.1103/physrev.140.b788. Pound, R.V. "Weighing Photons" (2000)". Classical and Quantum Gravity. 17: 2303–2311. Bibcode:2000CQGra..17.2303P. doi:10.1088/0264-9381/17/12/301. Misner, Charles W.; Thorne, Kip S.; Wheeler, John Archibald (1973-09-15). Gravitation. San Francisco: W. H. Freeman. ISBN 978-0-7167-0344-0.